Stamina Ab King Pro Ab/Hyper Bench offers a nice way to increase your total body strength by letting you work on your abdominals, glutes, legs, chest, back, triceps and biceps. 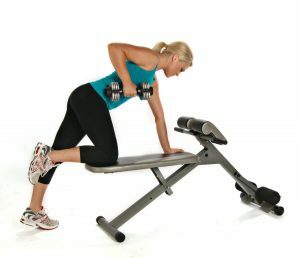 This is a four position adjustable bench so you can do your ab crunches for your central and upper abs in four different positions varying between flat and 30-degree decline, so you will be decreasing or increasing the intensity of your session by pulling the pin easily to adjust the decline angle of the bench. It has a pretty modern design, looks nice and you’re given two color options of pewter and red. The bench is nicely padded for your comfort and stitched with vinyl upholstery that makes it more durable and easy to clean. The thigh support is also stitched with vinyl upholstery and is conveniently adjustable so you can perform your core exercises better. You can do the standing hyperextension exercises to work on your lower back with the textured and also adjustable footrest to prevent slipping, the foam padded rolls to ensure ankle security during both the ab crunches and hyperextension exercises and the extended hand grips are within easy reach. The adjustability on the backrest, footrest, and thigh support is good for being able to change not just the height but also the intensity of your workout. Stamina Ab King Pro is quite a solid and sturdy, heavy duty unit that is even comparable to those you’d find at the gym with a 2 x 2-inch thick steel frame with a powder-coated finish that makes it resistant to scratches. The frame caps underneath are anti-slip to both help prevent slipping and to protect your floors. It is suitable for people of all heights- tall and short but if you’re big and very tall the width of the knee padding may be a problem when doing sit-ups as the roll set-up is a bit narrow, as reported by one of the customers. It is light enough to be picked up and has a foldable design so you can relocate and store it away easily. It has a maximum weight limit of 250 pounds (robust enough for many exercises) and measures 56 x 27 x 35 inches as assembled (you’ll put it together and one of the customers found it hard to assemble on their own but not the others), and for very tall adults bench may be a bit short to support head. But overall it looks good, does not wobble- is a very rugged and well-constructed unit for the price point with quite a bit of adjustability and support with adequate padding for your back, legs, and ankles and letting you a great range of exercises for your whole body, using your body weight and dumbbells. If you weigh more than 200 pounds and need something more solid and commercial grade, you’ll need to spend much more and if less than 200lbs, this one is perfect for the cost.